A Message From Japan To The World! In Japanese, the word mottainai expresses the disappointment, even distaste that a person feels when they see a thing or resource wasted. But looking past its definition, mottainai means primarily a state of mind long rooted in Japanese culture. Equivalent to the West’s 3Rs (Reduce, Reuse, Recycle), mottainai, however, also includes a philosophical and religious dimension, adding a 4th R for “Respect”. The idea of respect for nature, considered sacred, is deeply rooted in Japanese culture. The same applies to respect for things as, in Shinto mythology, all things have a soul. The concept of curbing waste as expressed in mottainai also includes the notions of sobriety, asceticism and interdependence advocated by Buddhist philosophy. Anchored in these concepts and history, mottainai is therefore much more than just an ecological slogan. For the Japanese, the expression mottainai conveys the idea that "This item still has value therefore it’s too good to waste!" It’s origin comes from an ancient Buddhist religious concept that regrets the waste or misuse of sacred or highly respected items, such as religious objects. It also relates to the Japanese Shinto spiritual belief that all objects have souls, no matter how humble and, therefore, are sacred. Over time, the mottainai notion became deeply rooted into the collective psyche of Japanese populace to indicate the essential view of not throwing away anything that might still have value, to reuse in some practical manner. The mottainai belief was especially consequential for the impoverished farmer and fisherman wives who needed, for financial reasons, to continue the lifespan of family’s clothing and household textiles as long as possible. The economic boom in the United State in the 1950s lead to a substantial increase in the amount of trash and litter produced by Americans due to the growing popularity of single use items. However, it was not long until people began to realize how significant the environmental impact of an unrestricted throw-away attitude was having on the Earth’s eco-system. In response, throughout the 1970s, many different laws were enacted in the United States to promote conservation efforts and raise eco-awareness to the general public. Thus, the Three R’s were born in the United States and, subsequently, internationally. The practice behind the idea of the 3 R’s of fabrics and clothing is to reuse, repair and recycle them and is, as mentioned, a recent development for the West. On the other hand, the Japanese began Reusing, Repairing, Recycling and Respecting their worn out fabrics and clothing going back many, many hundreds of years through their universal commitment to their homegrown mottainai belief. 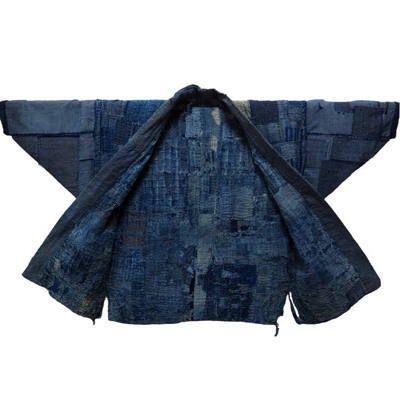 Antique Japanese folk textiles and clothing are some of the best examples of mottainai and can be said to be the consummate application of the 3 R’s from a contemporary Western point of view. 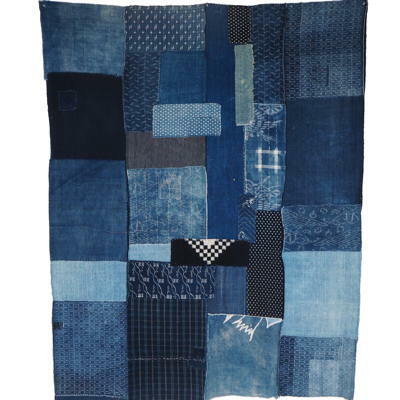 Aficionados of Japanese textiles enjoy acquiring historic boro textiles/clothing in order to display in their homes (or offices) as objets d’art. And, fashionistas are thrilled to show their friends and wear a hundred year old, exaggeratedly mended, boro indigo cotton or hemp farmer’s jacket or vest.